The New Zealand Wars fought between 1860 and 1872 were a time of acute tension and conflict in the nation’s history. But the wars were not without genuine examples of mutual respect among the contending Māori and British troops, along with occasional acts of great compassion and kindness towards enemy fighters. In the Tauranga district a remarkable document that bore some striking similarities with the First Geneva Convention signed months later in Switzerland also emerged during this period. In January 1864 several hundred British troops landed at Tauranga in response to reports that local iwi were providing support to Waikato Māori who had been under attack since July 1863. It soon became apparent that the war was almost certain to spread to Tauranga. Local chiefs accordingly issued a series of challenges to the British, in accordance with Māori beliefs that fighting should be conducted in an open, honourable and brave manner. Along with these invitations to fight came a letter setting out the laws that would be respected in any clash. Sent to the commanding officer of the British troops at the end of March, it set out that wounded soldiers would be spared so long as they made it clear they no longer wished to fight and that those who surrendered would also be saved. Civilians, including all Pākehā women and children, would not be harmed. These rules were drafted by Henare Wiremu Taratoa, a young lay reader in the Anglican Church who had been educated at St John’s College in Auckland. Taratoa had spent time at the Otaki mission station before returning to Tauranga when war seemed likely. 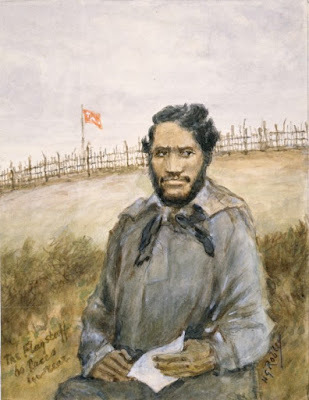 British troops did not know quite what to make of Taratoa’s rules, but they were closely adhered to by Māori when fighting occurred at Gate Pā (Pukehinahina) on 29 April 1864. Although the British suffered a heavy defeat, including many killed, wounded soldiers were unharmed. 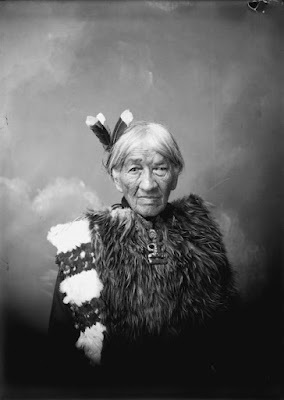 Heni Te Kiri Karamu, also known as Heni Pore (Jane Folely), risked death in order to take water to one of the British officers who lay dying inside one of the trenches. This gesture was later immortalised in a famous memorial at the Tauranga Mission Cemetery. 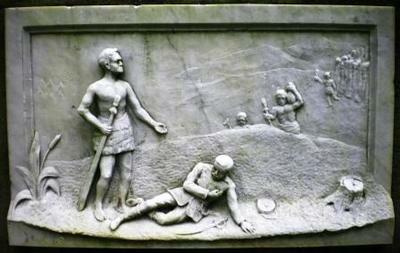 It depicts senior chief Rawiri Puhirake’s command to honour the rules of fighting agreed by Tauranga Māori, while in the background water is carried towards the wounded soldier. (Some versions have it that Henare Taratoa or a man named Te Ipu was responsible for taking water to the officer, Lieutenant-Colonel Henry Booth. It seems likely that several similar acts of this nature were shown towards British soldiers wounded at Gate Pā). Henare Taratoa was killed when British troops clashed for a second time with the Tauranga tribes and their allies at Te Ranga on 21 June 1864, resulting in over 100 Maori casualties. A copy of the rules of warfare he had drafted was found on his body, headed by a Biblical quotation – ‘If thine enemy hunger, feed him; if he thirst, give him drink’ (Romans 12:20). The example set by Tauranga Māori came to be widely admired and celebrated over time, helping to challenge earlier stereotypes of Māori as ‘uncivilised’ or barbaric. Instead, Gate Pā and the rules of warfare drafted by Henare Taratoa became a byword for chivalrous and dignified conduct at a time of great destruction and damage.